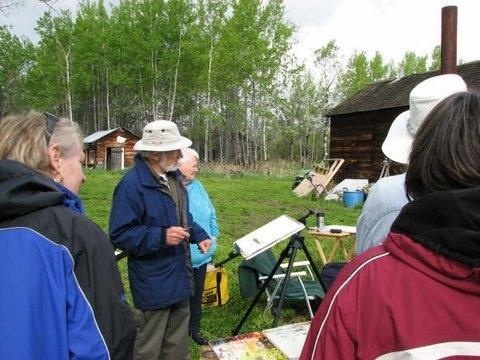 In keeping with the mandate set out by the Steering committee and the Feasibility Study of the Homestead, Annual Workshops have been established as a part of the programming on the McNaught Homestead Site since 2004. Educational opportunities, along with the opportunity to experience fellowship and mentoring in a scenic and peaceful setting in the country is a main feature of these workshops. The Schoolhouse/studio provides a centre for classroom type of instruction and the trails, various historic buildings, scenery and habitat provide a variety of subjects for inspiration. Field trips to other types of scenery and subjects are close at hand and easy to access from the homestead site four miles from the Town of Beaverlodge, Alberta. Hiring professional instructors for our Workshops enable the regional artists to access new information and inspiration without major travels or expense. Euphemia McNaught was a leading influence on Peace Country artists and the region as an artist, educator and advocate for the arts. The education she received at the Ontario College of Art and her studies there under noted artists such as Arthur Lismer and J.E.H. MacDonald changed the scope and style of her work for the rest of her life. Her dedication and inspiration led to the formation of art groups, facilities, events and programs throughout the region. Honoring her legacy through our programs is an essential part of the work of the Society. To find out more about our Heritage Living workshops and other learning opportunities, please contact us.